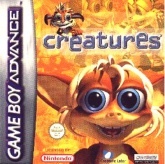 Creatures GBA (aka Creatures Advance) is the only game in the Creatures series to have been released on the Game Boy Advance. It was ported by Elo Interactive Media GmbH and Conspiracy Entertainment, and published on 20 February 2002 by SWING! Entertainment. It is essentially a port of Creatures PS1, but without the music. This was most likely due to limited space on GBA cartridges. This page was last modified on 3 July 2017, at 05:37.